Because of the foot & mouth outbreak in England and Wales I took the unusual decision to spend the Mayday weekend of 2001 in Scotland. I wasn't aiming for the higher mountains because there was still a lot of snow above 3000ft, but plumped instead for a few nights in Pitlochry. 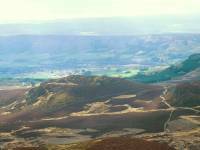 Ben Vrackie, a Corbett of 2757ft (841m) elevation, stands only 3 miles north of the town and makes a fine expedition of not much over half a day. The guidebooks don't give a translation of the name but it's a fair bet that it's a corruption of Beinn Bhreac (speckled hill). Photographic note: the weather was bright and the sun broke through on the descent, but these images still came back with a nasty colour cast. I've done as much as I can to correct it but they still look odd. Sorry. I'm beginning to wonder about abandoning Ektachrome after getting disappointing results ever since Kodak "improved" the chemistry. 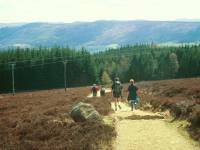 The ascent from Pitlochry involves walking up either East or West Moulin Road as far as the village of Moulin, taking a lane to the left (which heads for the Craigower golf course) and then another lane to the right which ends at a car park. Drivers can save themselves this first mile and will probably "do" the hill in half a day. 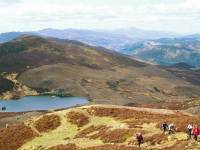 There's around 1500ft of ascent involved, making the climb of Vrackie the equivalent of an average Lakeland ascent. The route beyond the farm takes a track beside, then through, a forest plantation to emerge here in open country with about a mile and a half to walk. 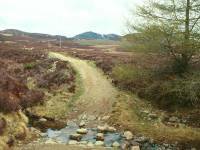 Initially there's a good landrover track which aids swift progress, traversing the rather gloomy moorland on the southern slopes of Creag Bhreac. 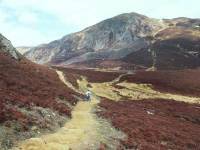 The track runs over a shallow col between Creag Bhreac and Meall na h-Aodainn Moire, at 518m. 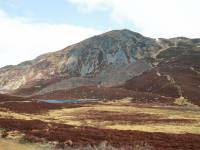 The summit dome of Vrackie stands ahead of you now, just three quarters of a mile away. 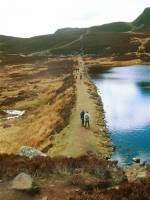 The track drops to cross the earth dam of the tiny Loch a Choire (corrie lake). 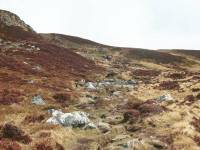 The route now lies directly up the corrie just east of Vrackie's summit and it looks daunting from below, but there is a good "made" path fashioned into rocksteps. 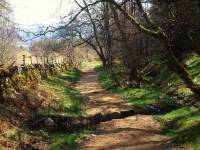 I'm always in two minds about these cobbled paths - they aid progress, prevent erosion and avoid mudbaths and stamina-sapping slogs up stony chutes. 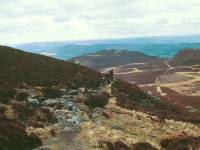 On the other hand they simply look wrong in a mountain environment - mountain walking is an escapist pursuit and you want the environment to look as natural as possible. 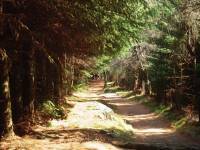 Artificial paths detract from the experience. Halfway up the main drag and already a view is opening up to the west. Schiehallion is peeping out above the loch. 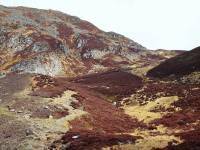 That's a bit more like it - primeval scenes of heather-covered rock as you ascend the corrie. A pause to look back at the ascent route. Despite the bright weather the atmosphere is gloomy - this would be a depressing walk in wet weather. Well above 2000ft now as a view begins to open up along Loch Tummel to the west. 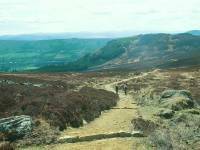 It requires physical effort, as do all mountain ascents, but it's completely straightforward and you soon find yourself approaching the skyline col between Vrackie and its eastern top. 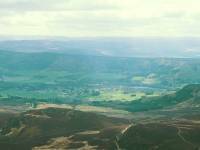 The skyline is reached and gives this glorious view back towards Pitlochry. Now to turn left for the summit. The summit arrives quickly - despite this being my first walk of the season I didn't feel stretched in any way. It almost felt like cheating to have arrived at the top of a Scottish mountain without feeling shattered. Looking back at the east top. 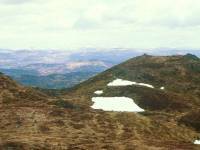 Patches of snow lying on south facing slopes shows how early in the season it still is. 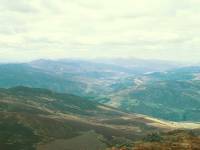 Your gaze is immediately drawn westwards from the summit to the Perthshire munros - the range from Ben Lawers to Schiehallion is seen pretty much end-on, with the trench of Loch Tummel to the right. 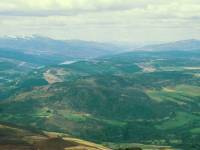 Pitlochry and Loch Faskally from the summit. 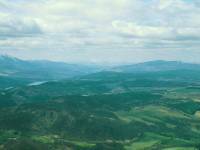 There's a topograph on the summit which shows pretty much everything in view - Vrackie is a splendid viewpoint from which most of the Grampian mountains are visible. The view extends from Arthur's Seat in Edinburgh round to Ben Nevis. 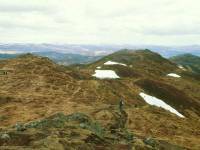 Summit panorama 1, looking southwest - Ben Lawers is the peak on the left with all the snow. 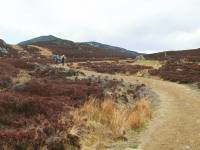 The hill on the right is Schiehallion. 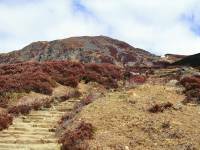 Summit panorama 2. 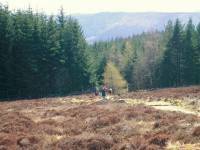 Looking south of west along the trench of Loch Tummel. 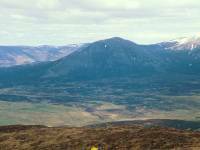 Schiehallion is on the left. Although it's not clear enough to make out detail, you can see the snow-topped Blackmount and Glencoe peaks on the far side of Rannoch Moor, beyond the head of Loch Tummel. I was able to make out Buachaille Etive Mor. Summit panorama 3, north of west. 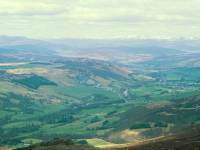 Kiiliecrankie and Glen Garry are in the foreground, with Blair Atholl visible. 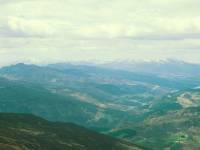 The snow-covered peaks in the background include Ben Nevis, the Mamores and the Ben Alder group. Summit panorama 4. 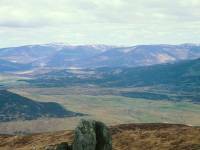 Northwestwards to Ben Alder and the hills west of Drumochter. 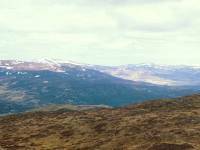 Summit Panorama 5, and the high glens east of Blair Atholl that lead into the Mounth. The lake is Loch Moraig, about 3 miles away. 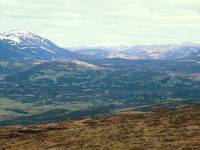 Summit panorama 6, just west of north, the Drumochter hills and the Gaick pass, with Beinn Dearg prominent. 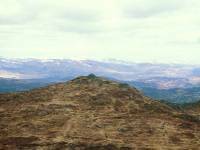 Summit panorama 8 - the Beinn a Ghlo massif, looking magnificent from here. 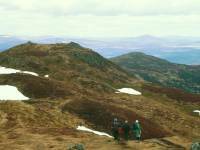 Summit panorama 9 - the Beinn a Ghlo massif continues, including Braigh Coire Cruinn-bhalgain, the Bealach na Fhiodha and the 3678ft Carn nan Ganhar on the right. 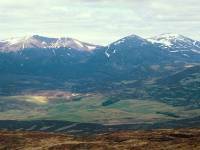 One of the high Cairngorms, possibly Macdui or Cairn Toul, is seen through the bealach. 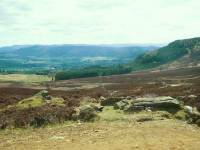 Summit panorama 10, towards the northeast - Ben Avon and its neighbours seen over the central Mounth. 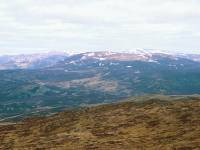 Summit panorama 11, to the northeast, looking at the west Mounth hills including Carn am Righ and Beinn Iutharn Mhor. Summit panorama 12. Not completely sure of my bearings here but those must be the Cairnwell mountains in the distance. Summit panorama 13. 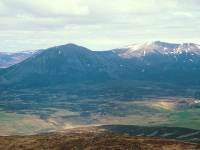 The southern approaches to the Mounth towards Spittal of Glenshee, overtopped by Glas Maol and Lochnagar. Summit panorama 14. 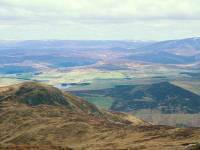 The east top, the desolate moors around Glenshee, and Driesh and Mayar in the distance. 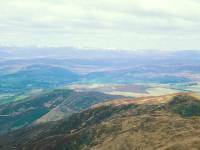 Summit panorama 15, looking east towards the hills around Glen Isla in Angus. 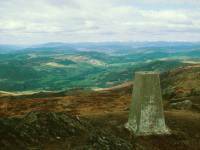 The summit trig pillar, with Glen Garry and Blair Atholl in the background. A telephoto shot along the length of Loch Tummel, with the Blackmount and Glencoe peaks on the skyline. 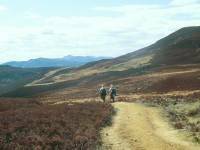 After lunch it was a leisurely descent back to Pitlochry. The Loch Choire dam again. Just as I'm well on the way back the sun comes out, transforming the sombre landscape. A really pleasant amble back along the landrover track. 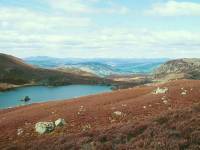 The sunshine brings out the rich colours of the moor. Back near the woods now, and suddenly there are dozens of walkers about. 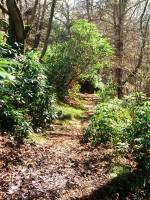 The track emerges at the side of the forest, with the sounds of a clay pigeon shoot not far to the right. 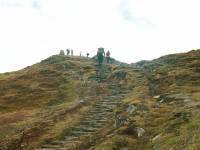 A diversion along a simple path to the right of the main track adds variety to the descent. A few minutes later I reached the car park, which was very full - there were also a couple of dozen cars parked awkwardly along the lane back into Moulin. 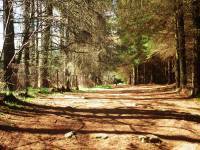 I reached Pitlochry on foot around 3pm and, after a shower, spent the afternoon lazing on the shores of Loch Faskally.